 Log In needed GE V151DA40 Metal Oxide Varistors (150VAC, 405V, 40,000A ) ~ New! 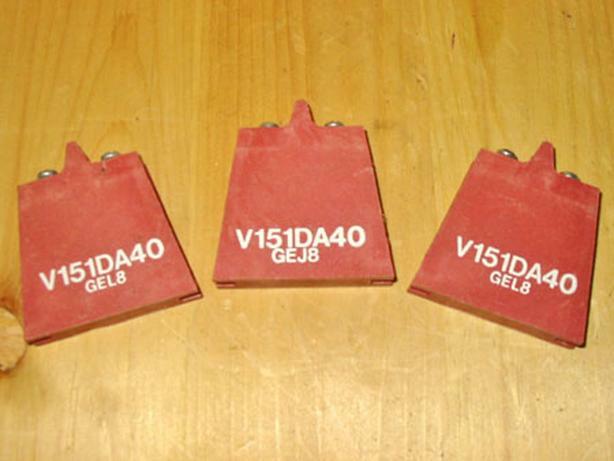 Up for sale is a SET of THREE (3) NEW GENERAL ELECTRIC V151DA40 METAL OXIDE VARISTORS, for CIRCUIT PROTECTION, and are recognized as "TRANSIENT VOLTAGE SURGE SUPPRESSORS". The GE V151DA40 DA Series Transient Surge Suppressors are heavy-duty industrial Metal-Oxide Varistors (MOVs) designed to provide surge protection for motor controls and power supplies used in oil drilling, mining and transportation equipment. These UL recognized varistors (UL File #E75961 to Standard 1449) have identical ratings and specifications but differ in case construction to provide flexibility in equipment designs. The GE V151DA40 DA Series devices feature rigid terminals to ensure secure wire contacts and feature improved creep and strike distance capability to minimize breakdown along the package surface design that provides complete electrical isolation of the disc sub-assembly and have a Wide Operating Voltage Range and come with additional specs. outlined below out ~ please feel free to email me for price, pick-up or shipping information.